Here's one of the last devlog posts of the year, and—if all goes well—the last devlog before the game releases. Some say that the last 10% of work on a project is actually another 90%. Another saying goes that a game is never finished, just in a good enough state to ship. Both of these are true for me on this project—as much as I've liked to work on Mobility, I'm glad to move onto something else after it is wrapped up, and improve my planning so it won't take two more years before you can play my next game. Let's get to the good part, shall we? I added a new difficulty setting called Growth. It's like Vanish, except the block will turn into a hazard after it has been stepped on. It will also slowly but surely grow in size—if you don't hurry, passage might be blocked off later. I playtested the game previously with some players who thought Contact was too easy, but Vanish was a bit too hard in some cases, and wanted an in-between setting. Now Growth is the new extreme, and Vanish becomes the new in-between option. This might seem like a stupid solution that doesn't solve this particular issue, but don't forget everything is relative—the mere existence of Growth makes Vanish look less intimidating. Currently I'm putting the final touches to the game's dialog. That means I'm doing spell check, trimming texts to remove unnecessary words, and changing word use in some places (I have a tendency to use words that are more fancy than is necessary). Problem: The game's dialog is scattered all throughout the game code. If you want to change one character of dialog, you have find that, and to change another, go to a completely different place. 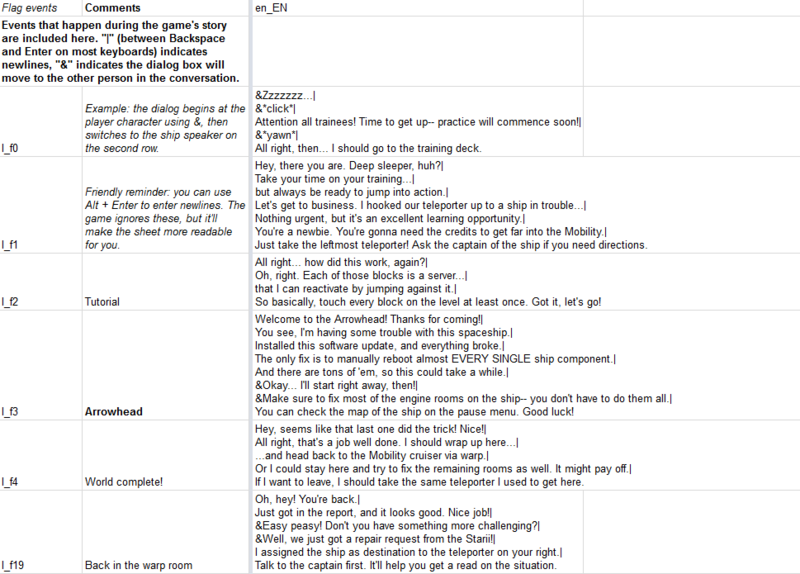 So I made a sheet that contains all of the dialog. It took some time to find everything in the game code and paste that in there. But now, at least I can change stuff quickly. But then how do you get that dialog back into the game? I based my method loosely as described in this Gamasutra article, and made a function that can export all strings as Game Maker code which I can paste into the project. - I now know how many strings, words and characters the game contains, and judge how much work it would be to translate the game in another language. - All of the game's text is in one place that can easily be searched and then exported to a format the game can read. And for the record: the story of Mobility has 3400 words, nearly 20000 characters, and consists of 57 individual conversations. And that's only all of the dialog, without counting all other text in the interface. I'm also working on a game trailer for Mobility. 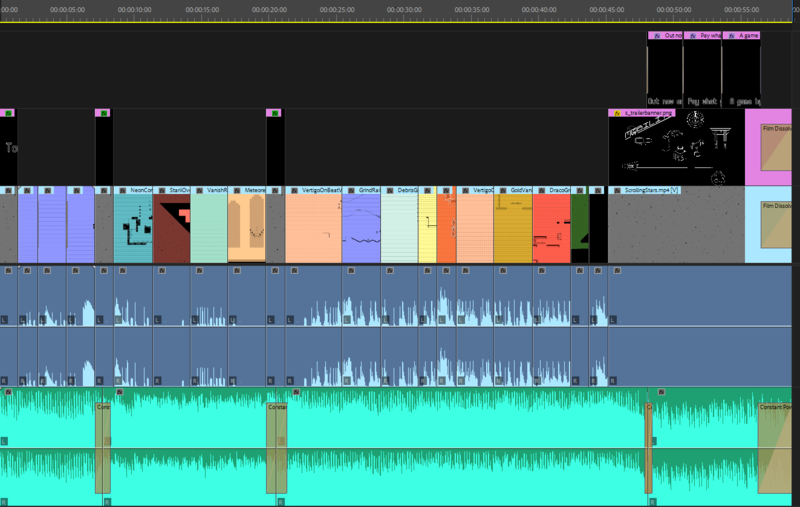 More on that in the next devlog when I can actually show you the trailer, but here's my timeline for it so far.